Most every leader is feeling the effects of the waves of social media technologies that are increasingly washing up on the shores of their organizations. It’s primarily been blogs since 2005 but now it’s also Facebook, Twitter, LinkedIn, and YouTube. Leaders cannot help but notice the demands for more organizational transparency, authenticity, responsiveness, and engagement from employees, customers, constituents, members, citizens, and the media–all of whom are increasingly adept at using social media technologies. If you’ve been reluctant to use social media technologies yourself in your role as a leader, you’re not alone. 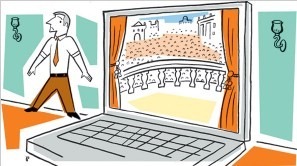 The problem was noted as early as 2006 when the New York Times published an article titled All the Internet’s a Stage. Why Don’t C.E.O.’s Use It? Author Randall Stross cited only one active CEO blogger among the Fortune 500. In the spring of 2010, Forrester CEO George Colony published a series of blog posts titled The Social CEO. In Part 1: Most CEOs Are Not Social he noted that not only were few CEOs using social media, but that even CEOs of the big social media companies weren’t exactly active users. In his recent series of blog posts on The Social CEO (Pt 1, Pt 2, Pt 3, Pt 4, Q&A), Forrester CEO George Colony seems to assume that social media technologies can only be used as tools for social networking. If I’m reading him right, I think this is a mistake. If these technologies were seen more as tools for leveraging one’s influence, then many more leaders would like be willing to deploy them. With the exception of a small minority of brilliant thinkers, smart social networkers, and publishing-oriented personalities, the social heavy model is a recipe for blowhardism. Think about it — how many people do you know with the erudition to make 30 worthwhile short statements per week, and one valuable long statement per week? Here’s a recent example by Paul Levy, President and CEO of Beth Israel Deaconess Medical Center in Boston, in a post to his Running A Hospital blog titled Brava, Maureen! I was out of town when President Obama made his recess appointment of Don Berwick to head CMS, and when the Institute for Healthcare Improvement announced that Maureen Bisognano would take over as CEO… Regular readers have often seen Maureen’s name on this blog. Her suggestions, for example, have made a huge difference in the way we have made our ICUs more patient- and family-centered. Levy’s using his blog post (tweeted here) to provide recognition, telling a short and simple story about someone whose efforts or actions embody his values and furthers his strategy and goals as a leader. Another Levy example: a blog post about a single employee whose actions reflect one of the hospital’s strategic initiatives. One of the most effective ways to acknowledge someone informally is to tell someone else a story about them. Why? Because it has a better chance to spread around. A positive remark directly to the person being acknowledged generally goes no further because to most people it would feel like bragging to tell someone else. But if the positive remark is made to someone else, then the recipient is very likely to repeat the story to others. A blog post recognizing an employee, a colleague, an organization or business in the community is an effective way to accomplish the informal form of recognition with the impact of the formal. Others see the post and mention it to the affirmed person; some pass around its URL/PermaLink via email to others; others blog it and retweet it, thereby widening its impact; and the search engines store the content of it indefinitely, thereby providing opportunities for serendipitous acknowledgement far into the future. I can imagine in the days and weeks subsequent to Levy’s blog post about Bisognano, she got a fair number of people saying to her "Hey, Maureen, I saw your photo in Paul Levy’s blog…"
Now admittedly, this is a far cry from the "Get into the conversation" conventional wisdom of the social heavies. And it contradicts the "Post incessantly to build followers" high-school behavior of many social players. But let’s face facts — most CEO don’t have the time or the capacity to play those games. They’ve got companies to run. In other words, Godin’s using social networking technologies very effectively to reach his audience without any of the ‘social’ or the ‘networking.’ (He does publish his email address and is reputed to be very responsive.) Rather, Godin is big on using these tools to leverage his influence. Not enough has changed since 2006 when Randall Stross published a column in the New York Times titled All the Internet’s a Stage. Why Don’t C.E.O.’s Use It? It need not be the case. Knowledge workers get paid extra when they show insight or daring or do what others can’t. But packaging the knowledge is expensive, time consuming and not particularly enjoyable for most people. As you get better at what you do, it seems as though you spend more and more time on the packaging and less on the doing. The intense conversations you can have with your customers and prospects, especially via a blog. Once you get the system and the structure set up, five minutes of effort can give you four minutes of high-leverage idea time in front of the people you’re trying to influence. Godin’s insight — “among highly-compensated workers, the percentage of the [knowledge] work you get paid to do goes down as you get paid more” and that “packaging the knowledge is expensive, time consuming and not particularly enjoyable” — was stunning to me and still is. In the course of any leader’s week, there are literally hundreds of interactions with colleagues, constituents, staff, media and other members of community. Whether these interactions are face-to-face, phone, electronic or paper-based, they comprise the bulk of how leaders exhibit their day-to-day influence. A phone call from a constituent, a conversation with a staff member at lunch, an email exchange with a colleague, an off-topic discussion at a team meeting – all likely evaporate into thin air, for all intents and purposes, as soon as they’re concluded. Even most paper documents such as memos and reports are quickly relegated to the trash, the shredder, or the filing cabinet, never to be seen again. With a blog, leaders can select from among this never-ending parade of interactions the ones that they deem strategically significant, and give them a longer “shelf-life.” With a posting to their blog, the story of the interaction gains immediate wider audience while making it significantly easier for that audience to pass the story around to others who they think should know about it. Prospective civic leader bloggers frequently ask, "How much time is blogging going to require?" It’s a fair question. Blogging feels like just another task when you first start out, and it does require some time commitment to work it into your week. But once you experience feedback from your blogging, that not only are others reading your blog but that it’s starting to have influence, your attitude towards the task of blogging changes because it becomes strategic. "I’m going to blog this because I know that she’ll read it and pass it on to…"
"When this group of people sees what I’ve blogged about this, then they’re more likely to…"
You start to realize that your blog leverages your leadership strategies in time-effective ways. 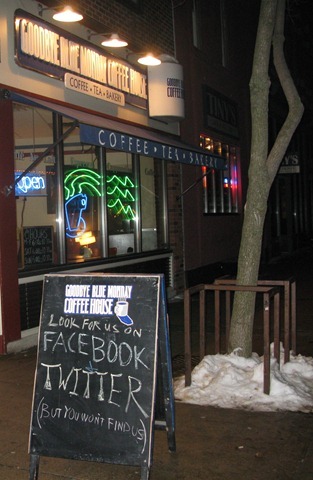 This sandwich board in the front of one of my regular Northfield coffeeshops, the Goodbye Blue Monday, caught my eye, not only because it’s clever (“Look for us on Facebook & Twitter – but you won’t find us”) but because I’ve been trying to get smarter about how Twitter and Facebook can complement a blog, both for me, my clients, and here in Northfield. Of course, no one approach fits all. Social media tools should be deployed in specific ways in order to achieve a specific outcome. But that generalization aside, I’m trying to determine what the issues are to consider for those who are wondering how Twitter and Facebook can be complementary to their blogs. I started thinking about this in earnest a week ago when I read blog developer and WordPress consultant Kim Woodbridge’s post from June 2009 titled Twitter and Facebook Integration: Stop Making Every Tweet Your Facebook Status. Kim argues that “posting automatically takes some of the social out of social media” but concedes that time is a big consideration for some people. The commenters on that blog post seem split on the issue. I’m always coaching leaders on the importance of using an ‘authentic voice’ with their blogs. In the past, however, I’ve rarely used an authentic voice on my own Twitter account, and likewise for the group Twitter account for our community blog, Locally Grown. It’s mostly been a manual Tweeting of blog post headlines. And on our Locally Grown Facebook fan page, the blog post headlines with excerpts are posted automatically to both the Wall and a special RSS tab. So today I checked out some of the other web-savvy people who I follow to see how they’re using these tools. Chris Brogan has a blog, an all-purpose Twitter feed, and a more focused Twitter feed. He doesn’t publicize his personal Facebook account. He also has a company, New Marketing Labs, with a blog, Twitter feed and a Facebook fan page. The company blog auto-updates to its Facebook Wall. Brian Clark has a blog, a Twitter feed, and a several other websites (eg, Teaching Sells) but no Facebook fan page. He doesn’t publicize his personal Facebook account. Chris Garrett has a blog, a Twitter feed, and several other websites (eg, Authority Blogger) but apparently no Facebook fan page. He urges people to follow (friend) him on Facebook. Seth Godin has a blog, a Twitter feed, and a Facebook fan page. His blog posts are automatically posted both to his Twitter feed (“This is a retweet of my blog”) and his Facebook fan page (“This is repost of Seth’s blog”). He follows no one on Twitter. Kim Woodbridge has a blog, a Twitter feed, a company (Anti Social Development) Facebook fan page, and urges people to friend her on Facebook. She manually updates her company’s Facebook Wall with her blog posts but also has her blog auto-update to a separate RSS feed tab. All these people, with the exception of Seth Godin, are very engaged with their Twitter followers, creating somewhat of an online-community feel to the feeds. They’re master curators, as they nearly always add value (and in a personal way) to whatever they decide to retweet. They use Twitter as an extension of their brands which they’ve already built elsewhere (blogs, books, speaking gigs, etc.). To me, this is somewhat similar to using content platforms like WordPress, Blogger, or Typepad to build a space for your online ‘presence.’ Twitter, however, is in a class by itself because its viral value rises as more people use it. But because Facebook is so big, creating a presence there (beyond your personal account) has to be considered as 1) a way to drive traffic to your own properties (your blog, your Twitter feed); and 2) as a place to engage your audience, even if you’re creating content elsewhere. Use an authentic voice when manually posting blog headlines to Twitter and to our Facebook fan page’s Wall. I’m hoping that the smarter that I get in my own use of Twitter and Facebook, the more helpful I’ll be to my clients and to the community of Northfield.